Consume And Produce. How To Balance Your Time. Scuba diving - a fantastic form of consumption! One of the most common questions that authors seem to get asked is “Where do you get your ideas for your books?”. The answer to both is a balance of consumption and production. You cannot produce creative work of any kind without filling your mind with wonderful and varied fodder for the composting of imagination. You must fill your creative well with new ideas. Your mind will combine these thoughts together in new ways for innovative writing – whether fiction or blogging, or anything else creative. Live a life worth writing about. Consume with enthusiasm and make time for it or your mind will wither and you may feel blocked, or uninspired. The word consumption is now tainted with gluttony in a consumer society that throws away so much. It is important to watch what you consume and don't overdo it as you can feel sick and unfulfilled by consumption to excess. Consuming bad experiences won't help your creativity much either. Watch what you put in your mind. Reflect and produce something new. Now take that experience, whatever it was, and turn it into words or images. Make something of it that stretches your creativity, that limbers up your creative muscles. If you read a book or go to a seminar, write an article or blog post on what you learnt. If you are struck by a painting at an art gallery, add it to your novel as an experience for your protagonist. Balancing what goes into your mind and what comes out again allows for a constant stream of creativity to flow. Get out there and experience life, and then write it out again. Wonderful! I live south of the Barrier Reef but learnt to scuba dive on Ningaloo Reef, Western Australia. 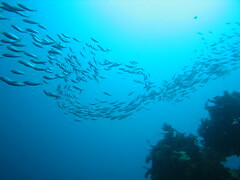 The picture is from the Poor Knights Islands where I dived a lot when I lived there. Diving is a marvelous pastime! I keep a notepad with me at all times so that I can jot down ideas as they come up. Or if I read something online that inspires an idea I’ll whip open the blog and write down the bones of it before I lose it. Like Joanna said, it’s a dynamic dance. Taking ideas in and churning ideas out. Some of them are golden and some of them are well….not so golden. Bu the process keep the creative brain alive and ticking. It’s interesting that you’re writing about this because it’s something I get asked about frequently. People will ask how I come up with ideas for blog posts. I usually keep a notepad handy and just jot down ideas while I’m reading other blog posts, and sometimes I’ll even look at the comments in another blog. I think reading other blogs is really key to coming up with content. Definitely valuable stuff here. Hi Srinivas, I get asked this as well! I did have 2 blogs before this one and did run out of ideas for them. I think running out does indicate it is not the right subject for you anyway.